The need to reduce atmospheric emissions of carbon dioxide from industrial sources is now recognized internationally. As a result, companies operating coal-fired and other types of power plants in the southeastern U.S. have been seeking information on the potential for long-term storage of CO2 in nearby subsurface geologic formations. 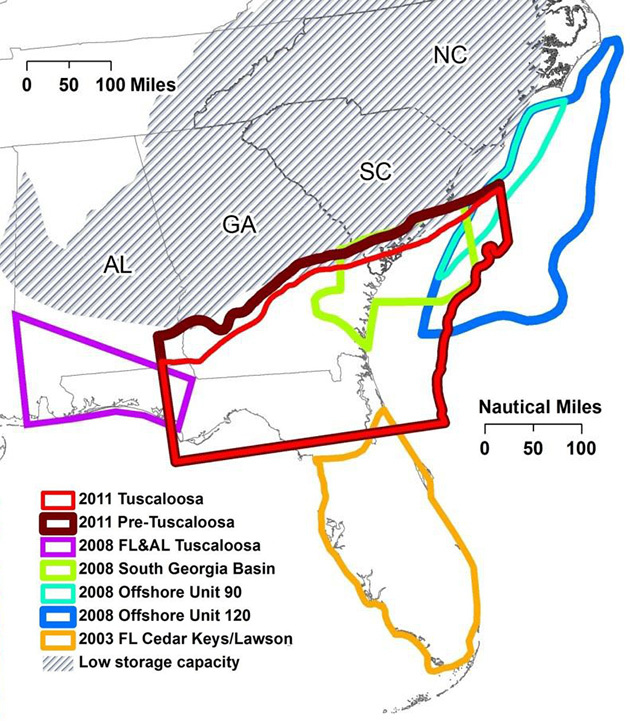 Previous studies have shown there to be little to no capacity for onshore subsurface storage of CO2 in deep saline reservoirs in the Carolinas and northern Georgia. However prior to this study, southern GA had not been assessed for geologic sequestration capacity potential. It is currently not known if extensive petroleum reserves exist below the continental shelf of the Atlantic Ocean offshore from SE US but potential offshore capacity for storage of CO2 is large. refine capacity estimates for portions of offshore geologic units present below the nearby Atlantic continental shelf. Post- Tuscaloosa sandstones and limestones of Late Cretaceous age The two intervals with sufficient thicknesses of net permeable clastic strata, at depths deep enough to store CO2 in supercritical phase, are Pre-Tuscaloosa and Tuscaloosa. The total capacity for the Pre-Tuscaloosa GSU, using an efficiency factor (E) of 2 percent, is ~111 Gt over an area of ~74,000 mi2 (191,000 km2). 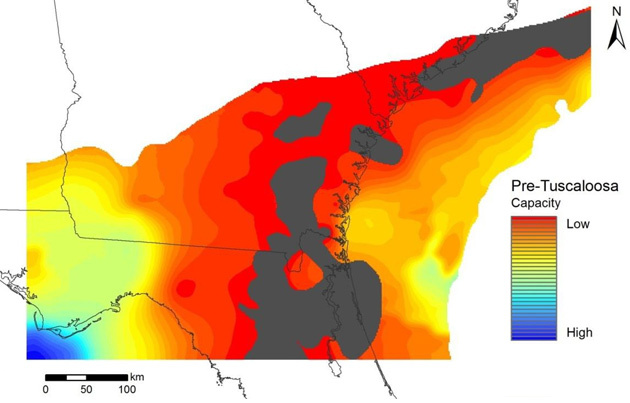 Areas with higher capacity are in offshore portions of the SW and SE GA embayments, which is where the thickest accumulations of permeable sands and highest estimated porosities lie. Even though the results presented here provide more accurate capacity estimates than previously calculated in the SE US, they still need to be refined by site-level investigations. The method for calculating capacity (MIT, 2010) is meant to be used for regional assessments without refined estimates of specific intervals into which the CO2 will be injected. For example permeability is not considered so inter-well heterogeneity (connectedness of sands identified in individual wells) is not taken into account. Maps and cross sections generated during this study are consistent with earlier research results in terms of (1) gross vertical and lateral distribution of major geologic strata and (2) patterns of deposition of sedimentary strata being controlled by the following regional structural features: Southwest Georgia Embayment, Southeast Georgia Embayment, and the Central Georgia uplift/Florida Peninsular arch (referred to by some researchers as the Suwannee Saddle. 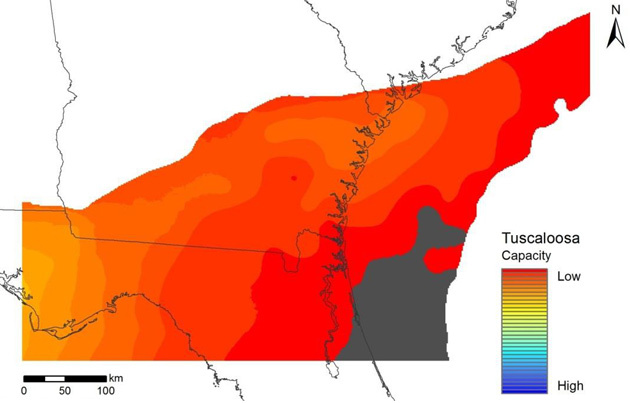 Operators of coal- and natural gas-fired power plants, and other types of industrial facilities, that release significant volumes CO2 to the atmosphere have options for GS in the SE US.